Published in the Dover Express, 23 May, 1980. The Custom House, which gave Custom House Quay its name, stood on the dockside from 1807 to 1922 when business switched to sea front premises. The original Dover Custom House was at a place called the Mount, at the top of Snargate Street. When the Harbour became developed, in the Pier district, the up-town Custom House seemed out of place, and Jacob Breams, who farmed the Customs in 1621, made an attempt to remove the business. This the Corporation strenuously resisted, but in 1682, the receipt of Customs was removed to a place called the New Buildings, on Custom House Quay, where Minet and Fector’s Bank was afterwards established, and part of the site of the bonded stores originally built by Lukey's. Those buildings, in 1806, had become very old, necessitating the provision of a new Custom House. Five houses were pulled down on Custom House Quay, and the Government erected a new building, which was opened for business on the 9th October, 1807 and continued a busy spot until 1922. In 1911, however, a Customs watch house was built on the South Pier. A central section of the Pier District constituted the bed of the ancient Paradise Harbour, which, having long since silted up, was built over soon after 1800. The streets that were made there no longer exist, having been cleared away in connection with the Pier Improvement Scheme. This area was bounded on the north and northwest by Bulwark Street and Limekiln Street; on the north-east by Elizabeth Street; and on the south and south-west by the Dover and Deal Railway, The streets actually within the area previous to the demolition of property to make a clearance for building the Pier Viaduct, which commenced in 1913, were Oxenden Street, running, approximately, from north to south, and Strond Lane, Hawkesbury Street, Paradise Street and Round Tower Lane, running from east to west. According to a plan of Dover dated 1737, preserved in the British Museum, the waste land left by the filling up of Paradise Harbour occupied the whole of that area, with the exception of Strond Lane, which, at that time, ran direct out of Strond Street, across the site of the old London, Chatham and Dover Railway’s Harbour Station and touched the northern angle of Paradise Pent. The choking up of this old harbour commenced early in the reign of James I, and the Harbour Commissioners, then constituted as the new governing body, made no effort to retrieve it, seeming rather anxious that it should gradually develop into building land, which would swell their revenue from ground rents. After an interval of sixty years, in the reign of Charles II, it had become a marsh. It says little for the wisdom of the Harbour Commissioners that they allowed this marsh to remain for more than a hundred years a reed-covered, evil-smelling swamp, acting as a cesspit for the sewage of their property that surrounded it. It was in that condition in the year 1800, when the Harbour Commissioners, finding their legitimate revenue from shipping falling off, sought to redress the balance by squeezing more out of the lessees of their existing property, and by attempting to dispose of the Paradise swamp as building land. Before the Commissioners had disclosed their plan for putting pressure on the general body of their lessees, they sold the right to build on the whole area of Paradise pent for the sum of £3,522, plus the ground rents from leases to be granted for houses to be built in that area. 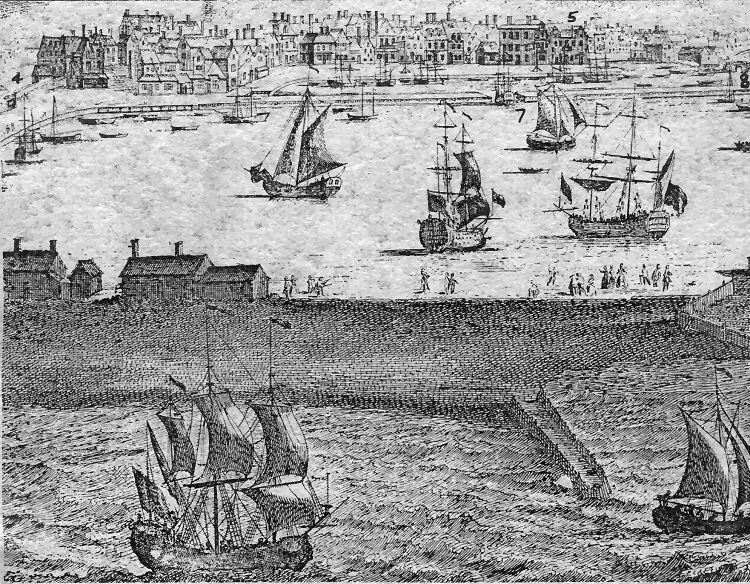 A section of a 1739 Buck print (another section of which appeared in Part 64) showing the tidal harbour, running parallel with which is the Granville Dock, with its entrance at (7) and access under a drawbridge to the Pent or Wellington Dock at (8). Top left (4) is a corner of Paradise Pent in the Limekiln Street area. Facing Granville Dock is a densely built-up Custom House Quay — now the site of Hammonds’s warehouses — with the old Custom House to the right (5). Off the picture, bottom right, was the South Pier. 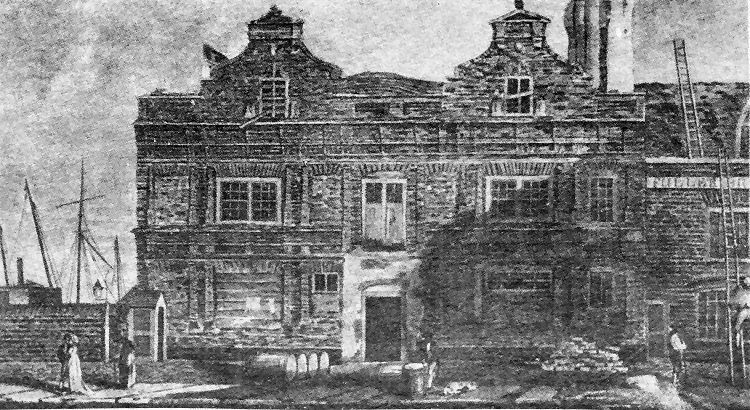 The above picture, is an engraving of the Dutch style Custom House building which stood on Custom House Quay from around 1600 until demolition in 1806.